Yes we arrived home after our three month ‘World Tour’ on the 9th April and it was so spectacular that it has taken me some time to come down to earth again! The question all my ‘arty friends’ are asking is – “Did you get any painting done on your travels?” – well the answer is yes but only one, while staying in Leopold near Geelong, Victoria, Austrailia with Elaines Brother Peter and his wife Moira. Moira is also an artist and loves painting gum trees. 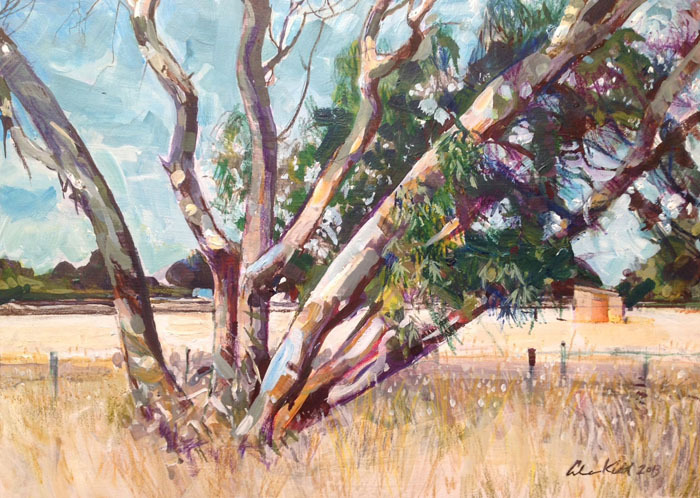 She persuaded me to come out sketching with her down the rail trail where we found some interesting gum trees. I did the following pencil sketch and took some photo reference!